Views - MTN vs Vodacom: Which share offers more potential? While there are a few telecommunication companies to invest in on the JSE, MTN and Vodacom are the two dominant players. But for investors looking to invest in the sector, either to achieve portfolio diversification and/or looking for capital gains, which of these stocks is the preferred one? I will attempt to answer this question by looking at the two companies’ performance relative to each other. If we perform a regression analysis, we can further break down the data, making the two shares more easily comparable. If you take a look the last time MTN/VOD was -2 Standard deviations apart, you can see in the graph how the relative value returned to a more ’expected’ valuation. 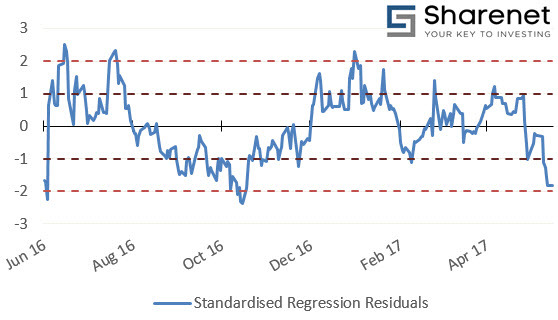 Likewise, when the standard deviation was +2 (Vodacom undervalued relative to MTN), the relative value returned to a more ’normal’ range. On 21st of October when the standard deviation was -2, if one bought MTN and sold it at -1 standard deviation (conservative estimate) or held it until the mean (solid black line), MTN price performance was 6.53% and 7.57% respectively, while Vodacom was down -1.29% and -0.92% (total outperformance of 7.82 and 8.49%. If you had held MTN until you made the switch to Vodacom at +2 standard deviations, you would have a return of nearly 26%. Look to switch from Vodacom to MTN (or buy MTN if looking to enter the sector) until the relative price of Vodacom to MTN becomes undervalued.